Peter Wadhams is interviewed by Stuart Scott, Executive Director of United Planet Faith & Science Initiative, in this video called Farewell to Arctic Ice, uploaded December 27, 2016, and recorded at UN climate negotiations in Marrakesh, Morocco. Peter Wadhams is an 'expeditionary' scientist and Emeritus Professor of Ocean Physics from Cambridge. 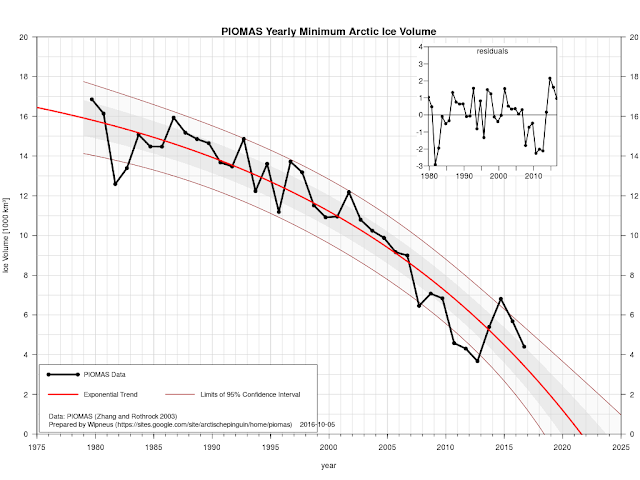 Peter Wadhams' observations of the Arctic ice for over 4 decades makes him one of the worlds authorities on the subject. 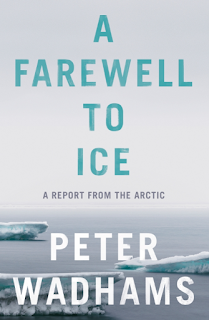 In the video, Peter Wadhams discusses some of the issues described in his current book A Farewell to Ice (right), which is available as hardback or ebook (256 pages, published September 1, 2016). Below is the sea ice volume image (created by Wipneus) that is discussed in the video. Mark Jacobson gave a presentation called How the Future of Energy Impacts the Future of Our Cities, as part of the Digital Cities Summit, October 2016. The video was uploaded on 7 Dec 2016 by Stanford University School of Engineering. Imagine a future where the entire U.S. energy infrastructure runs on clean, renewable energy. It’s possible to do it by 2050, says Stanford civil and environmental professor Mark Jacobson, and even without any new technologies. Mark Jacobson laid out the hidden upside of using solar, wind and water resources – rather than burning fossil fuels – to power everything from appliances and machinery to cars and building systems. “If you electrify everything, something magical happens. Without really changing your habits, you can reduce power demand by about 42%,” Mark Jacobson says. Such a huge reduction in power demand comes mostly from the efficiency gains of electricity over combustion and eliminating the energy needed to mine, transport and refine fossil fuels. 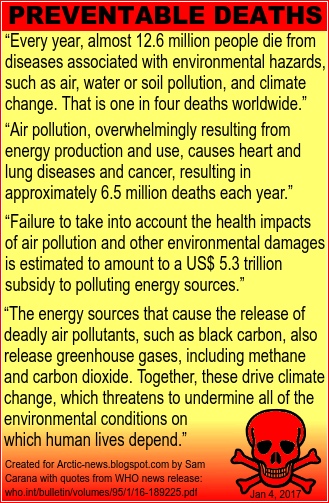 In addition to the pure energy savings, Mark Jacobson estimates that we could avoid 4 million to 7 million deaths from air pollution, eliminate $15 trillion to $25 trillion in global warming costs, create 17 million more jobs than would be lost if we don’t transition, and reduce the energy poverty of up to 4 billion people worldwide. For more, click on the links at Roadmaps to convert 139 countries of the world to Wind, Water, and Sunlight (WWS) for all purposes. Paul Beckwith produced a two-part video, called 'Abrupt Climate Disrupting Arctic Changes'. The first part is at Part 1 of 2 and the second video, featured below, is at Part 2 of 2. The videos were uploaded on December 30, 2016. In the videos, Paul Beckwith describes that gut-wrenching disruptions are underway in the Arctic, including record-high temperatures, near-record summer ice loss and spring snow cover loss, and record low sea-ice winter growth. This second video is particularly interesting at the segment from 8:30 to 12:00 minutes, where Paul Beckwith discusses how wind patterns are changing over the Arctic and how this will make the Beaufort Gyre and other ocean currents reverse when we get complete sea-ice loss. 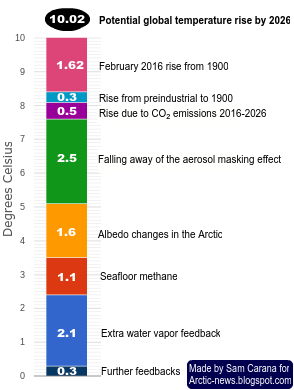 For more on this, see also the post Accelerating Warming of the Arctic Ocean. Peter Wadhams also featured in this video interview by Jennifer Hynes for ExtinctionRadio, uploaded December 29, 2016. There is also a shorter version of this interview, without music. The interview is part of episode 62 at ExtinctionRadio.net, uploaded December 28, 2016. This episode also includes interviews by host Mike Ferrigan with Paul Beckwith and Tim Garett. Guy McPherson gave a presentation at the Fayetteville Free Library in Syracuse, New York, on December 22, 2016. Part 1 is the presentation, featured below. Part 2 covers questions and answers, following the presentation. The videos were uploaded December 27, 2016. Two images used in the presentation are added below. Below, the timeline of Earth's temperature in history after a graph by Chris Scotese, from The Politics and Science of Our Demise. An earlier presentation was given by Guy McPherson in Wellington, New Zealand. The presentation was given at Victoria University in Wellington and was streamed live at 6:00 p.m. New Zealand time on 6 December 2016. The video was uploaded on December 7, 2016. Yikes doesn't even begin to describe Corporate $ gone mad on Open System Biosphere for profit vs the chances of pulling out of Closed System Heat. The showdown of the stretch of probability reach is kind of out on a limb or rather a plank overboard of pirate ship Hope that the Shark Jump is fun, certainly the people holding the notes of entitlement $ agitate.